California king mattress very close in size to the regular king size mattress, but with a different proportions in width and height. It is 72” (182.9 cm) wide and 84” (213.4 cm) long or 4 inches narrower and 4” longer in comparison with a standard king. With such measurements it will be the best option for extremely tall people. California king bed will be perfect for placing in bigger bedrooms with no worries about room size limitations. Proportionally different to king size California king mattress has only about 1% smaller area, but very similar in height and weight due to nearly the same overall size. 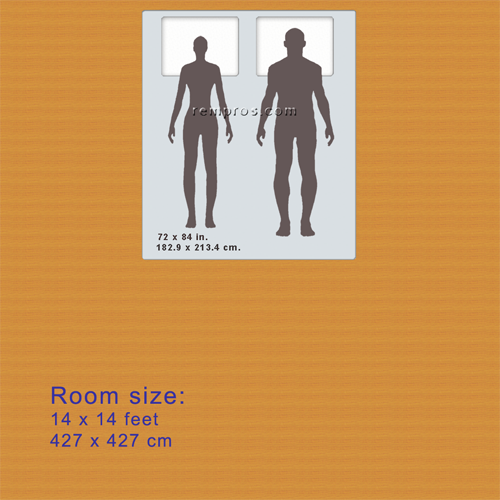 Dimensions of california king size mattress were proportionally resized according to average men heights - 5 feet 10 inches (1.778 meter) and average women heights 5’ 4 ½" (1.638 meter). Master bedroom size - 14 x 14 feet (427 x 427 centimeters).